19" x 19" Machine pieced and quilted. 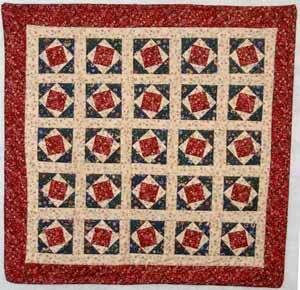 It is 1/2 scale of the Sweet Peas pattern found in the American Patchwork and Quilting Magazine, Feb, 2005. 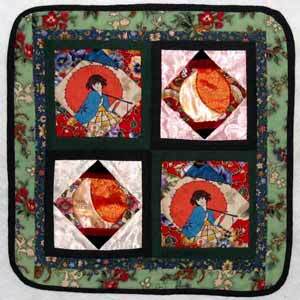 The embroidery and button design in the border is an original design. The River Lea Quilt Guild of Grand Island NY recently held their end of the year picnic at the River Lea Historical site on Grand Island. During the picnic the guild displayed and voted for their favorite challenge quilts. 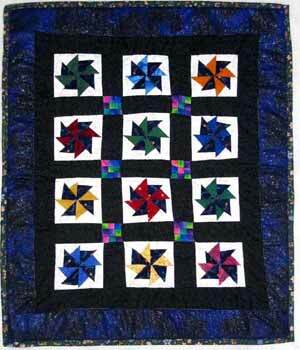 The 2005 challenge contest rules were that the quilt could be any size, but all blocks had to be 4 inches or smaller. Also, pieces of the two challenge fabrics were to be included and easily identifiable. Seventeen quilts were entered and three prizes were awarded: a first prize and a tie for second place. Several quilts were disqualified as they did not have both fabrics (we don't always listen or read directions well, do we?) 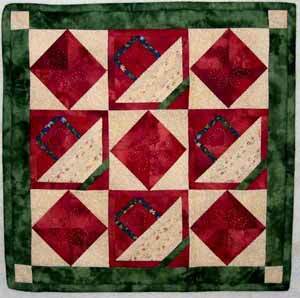 and one was disqualified for having several blocks in the body of the quilt that were bigger than 4 inches. We hung all of the quilts though, so everyone could enjoy them. We did enjoy the challenge though, as several of the guild members had never done miniature blocks before. Those tiny pieces are really difficult to work with aren�t they? 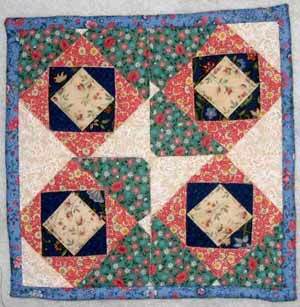 In Feb. 1990, the guild was founded by six friends who quilted together. Their first meeting was held at the Grand Island Memorial Library where 25 people responded to an article placed in the Island Dispatch by the founding members. The Guild has continued to grow and has between 60 and 70 members. 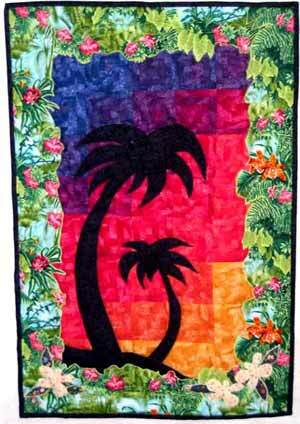 Every year a committee of two members, select special fabrics, cutting them into 1/4 or 1/3 yard pieces for members interested in participating in the challenge. 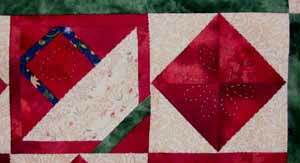 The yearly challenge is to fashion a wallhanging or small quilt using the fabrics provided, plus others, within the specific quidelines set up each year by the committee. Each member must work secretly, not discussing their project with other members. 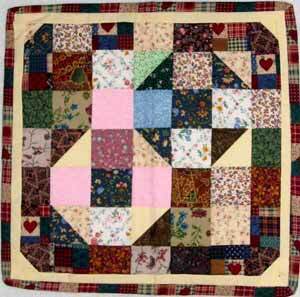 The quilt may be done by hand or machine and may be embellished with other decorations. The challenge quilts are hung and voted on at the annual guild picnic held on the grounds of a historic home called River Lea. "May your sorrows be patched and your joys be quilted"
Asian Splendor by Susan Loos, 16" x 16� Hand pieced and hand quilted. A one-half scale from a pattern handout at Jo-Ann Fabrics. Greens and Blues in silk with some velvet and cottons. 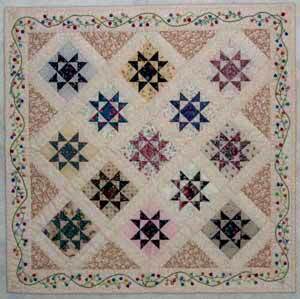 Big Mama Fly by Sandie Nethero, 30" x 30� Machine pieced and quilted. Pattern: Shoo Fly, from an article in Quilters Newsletter: Big and little blocks, 9 patch blocks forming larger 9 patches. Bow Ties by Kathy Gray, 8 �� x 10 �� Machine pieced and quilted. 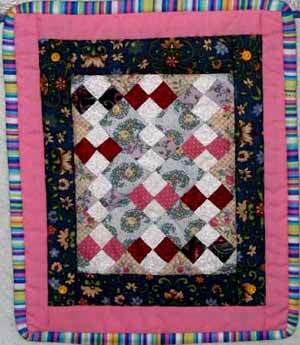 Bowties pattern from Miniature Quilt Magazine Carolina Lily by Helen Keohane, 5 �� x 5 �� Machine pieced and quilted. Paper-pieced. 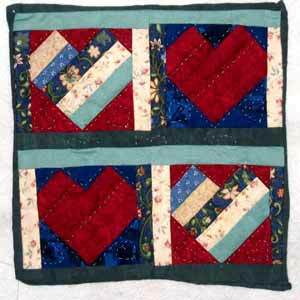 Heart by Jean Brighton, 7" x 7� Machine pieced. 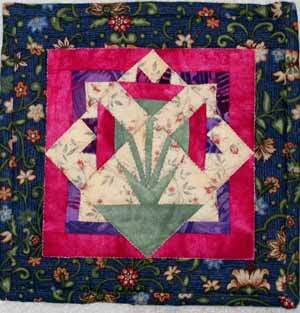 Paper-pieced pattern from Carol Doak. 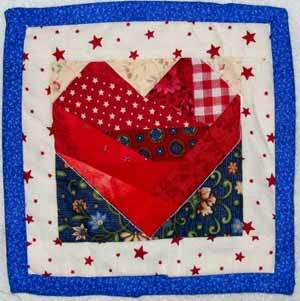 Heart by Colleen Eddy, 5" x 5� Paper-pieced. 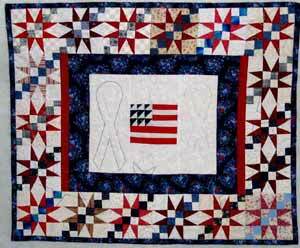 It's a Small Honor by Judy Buzby, 4 �� x 6 �� Paper-pieced designed by Diane Hansen and published in Fons and Porter's Love of Quilting, July/August 2003 Mini Square Within A Square by Ken Beagle, 24" x 24� Machine pieced and quilted. An original design. 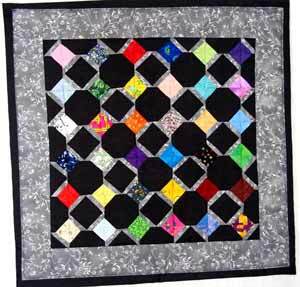 Pin Wheels by Hazel Rowe, Machine pieced and quilted. An original design. 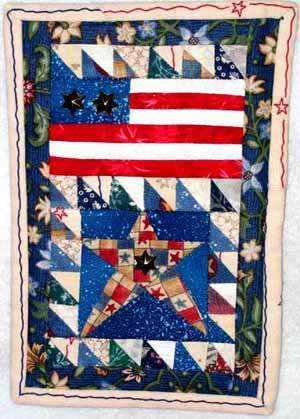 Red White and Blue Starburst by Amy Garten 24� x 20" , Machine pieced and quilted. From Sisters and Quilts --Threads That Bind by Ann Seely and Joyce Stewart. 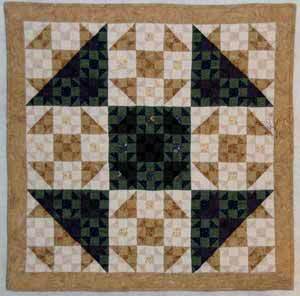 Scrappy Squares and Triangles by Doris Matthews, 15" x 15� Variation from "Miniature Quilts" Fall, 1993. Small Bedspread by Susan Loos 8" x 10" Hand pieced and hand quilted. An original design. 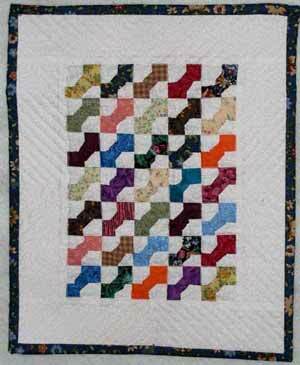 Spools by Diane Doane, 15 �� x 15 �� Machine pieced and quilted. Taken from Easy Paper-Pieced Miniatures by Carol Doak. Black background with multicolored spools. Square In A Square by Maire Machens, 8" square, paper-pieced 4" blocks, original design.